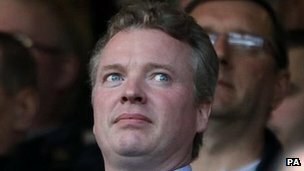 Rangers FC owner Craig Whyte has appeared at Glasgow Sheriff Court to contest a case over an alleged unpaid £90,000 repair bill at his castle. Mr Whyte, 39, owner of Tixway UK Ltd, ordered supplies from One Stop Roofing to repair the roof at his property in Grantown on Spey. It is claimed that Tixway failed to maintain a repayment plan agreed at the start of the 2010. Mr Whyte is disputing the claim at a civil case. The Rangers owner told the court he was introduced to the owner and director of One Stop Roofing, Robert Jenkins, in April 2008 through friend and businessman Chris Keating. The court was told Mr Whyte helped Mr Keating's own business by lending money when it was required. It was said that Mr Keating regularly bought supplies from the roofing firm. Mr Whyte told the court the only orders made by him, and that he was invoiced for by One Stop Roofing, were for the repairs he was carrying out at Castle Grant. He said he did not agree for invoices for Mr Keating's business to be sent to him or paid by him. Mr Whyte also told the hearing that he only met Mr Jenkins on one or two occasions. A murder inquiry is launched after a body found in Clydebank is confirmed as that of missing local teenager Paige Doherty.